This chapter is devoted to the discrete approximation of abstract elliptic and implicit evolutionary quasi-variational inequalities. Convergence results for internal approximations in space of elliptic quasi-variational inequalities together with a backward difference scheme in time of implicit evolutionary quasi-variational inequalities are proved. 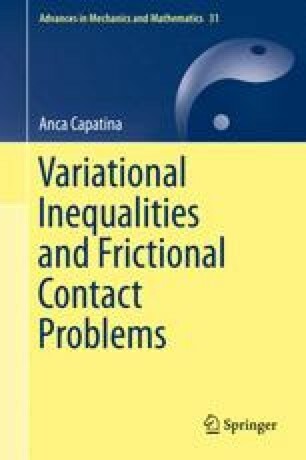 The results obtained in this chapter, representing generalizations of the approximations of variational inequalities of the first and second kinds, can be applied to a large variety of static and quasistatic contact problems, including unilateral and bilateral contact or normal compliance conditions with friction. In particular, static and quasistatic unilateral contact problems with nonlocal Coulomb friction in linear elasticity will be considered in last part of this book.